What does the term "full boat" mean in the world of poker? What is meant by a full boat in the world of poker? 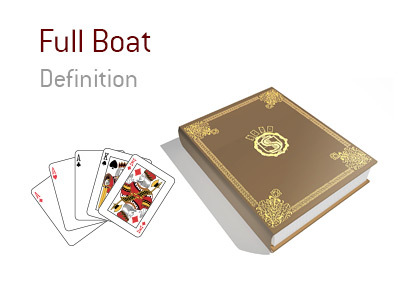 In poker, a "full boat" is slang for a full house. For instance - let's say that you are dealt pocket Aces in the big blind. There is an early raiser with a couple of callers. You re-raise and everybody decides to come along for the ride. The flop brings A-K-K, which is obviously a very good flop for you. Your hand is A-A-A-K-K, which gives you a full house. Or, as some people like to call it, a "full boat". This is obviously a very strong hand, as there is only one hand that beats you - pocket Kings. Given the fact that all of the fellow participants in your hand called your re-raise, you are almost certainly ahead in the hand, unless somebody decided to get very sneaky with a pair of Kings. In this scenario, there is a fairly good chance that one of the players has a King in their hand, which means that you could potentially take down a very big pot. Most casual players would have a very hard time getting away from a King in this situation.